Helping our country’s active military personnel, veterans, and their families isn’t something new for us. AT&T has a long history of supporting the military. 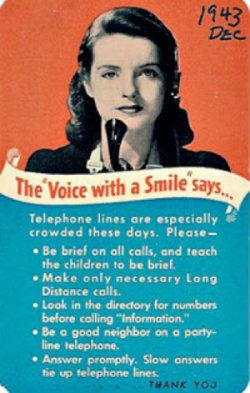 Nearly 71 years ago, our telephone services played a big role in World War II. Can you imagine a world without your phone? During the war, Americans were expected to go without a lot of things – food, car tires, gasoline and telephone service. Almost 18 percent of our work force – or 67,700 Bell System employees – joined the armed forces. Of these, 6,200 were women. In all, 1,230 employees gave their lives, according to the 1945 AT&T annual report. We built and ran telephone systems at hundreds of military camps and bases, many in less-populated areas. 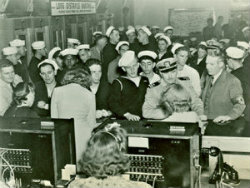 Operators left home posts to handle the calls in the war centers. Overseas telephone service, developed by the Bell System, provided instant communication on battlefronts. Written messages were exchanged via our teletypewriter exchange service. We helped the U.S. Army's Signal Corps – in charge of communications for the armed forces – teach soldiers to install and maintain telephone and teletypewriter systems. Classes were at our training schools. Day or night, telephone operators were poised, ready to report it if enemy aircraft should venture over domestic skies. An intricate system, developed by AT&T and the military, meant connecting calls – in about 30 seconds -- from aircraft spotters to Army Information Centers. All 2,000 of AT&T's scientists and engineers had a single focus – the war. "Bell Telephone Laboratories – fountainhead of so much of the world's knowledge of electrical communication – is working hand in hand with the Army and Navy to create the best electrical weapons that can be devised," the AT&T booklet said. When we say we support veterans and their families – we mean it. At AT&T veteran hiring isn’t something we do to meet a target, it’s something we do because it’s good for veterans and good for our business. Our own Johanna Martinez, Military Talent Acquisition Manager, knows why we invest in veteran employees - they make amazing employees. We’re on a mission to hire 20,000 veterans by 2020. Learn more about our participation with the Veteran Jobs Mission. We offer a Transition Assistance Program (TAP) that can help veterans figure out what career will be right for them after their service. Our Veteran Employee Resource Group is 9,700+ strong, provides mentoring programs and support for active military serving in combat zones. The AT&T Veteran Talent Network provides up-to-date information about jobs. Our Job Search Advisor sessions give veterans a chance to speak directly to our Military Talent Acquisition Managers and learn about AT&T first hand. We offer a support network for military spouses and our MilSpouse Virtual Job Advisor sessions provide transition assistance and career advice. Find out what life at AT&T is like for veterans.